ACQUA Android is now in the Play Store. It is still in experimental mode, but you can already download it and enjoy the features it provides in terms of fine grained diagnosis of your Internet access and your quality of experience. Click here to get the code from the store. Our paper on “From Network Traffic Measurements to QoE for Internet Video” is accepted at IFIP Networking. Bravo to Jawad and Thibaut for this nice work. Click here for a copy. A paper describing ACQUA plus first analysis of the collected data to be presented at the 3rd QoE Management Workshop in Paris. Click here for a copy. Karyna’s paper on “On the Cost of Measuring Traffic in a Virtualized Environment” got Best Student Paper Award at the IEEE Cloudnet 2018 in Japan. Click here for a copy. Bravo to Jawad for his paper to appear in Computer Networks, “An Intelligent Sampling Framework for Controlled Experimentation and QoE Modeling”, an extension of Internet-QoE and ICC papers. Click here for a copy. I am Senior Researcher (Directeur de Recherche) in the DIANA project-team at INRIA, Sophia Antipolis – Méditerranée Research Centre. The DIANA team is the successor of the PLANETE team. I got my Electrical and Electronics engineering degree from the Lebanese University of Beirut in 1997, and my Master, PhD and HDR degrees in Networking from the University of Nice Sophia Antipolis in 1998, 2001 and 2009, respectively. My PhD was done in the MISTRAL project-team at INRIA Sophia-Antipolis under the direction of Eitan Altman and my HDR treated a set of solutions for efficient Internet monitoring. From April 2001 to March 2002, I was with the LCA department at EPFL-Lausanne for a post-doctoral position (with a grant from Sprint Labs working in the group of Patrick Thiran), and from March to August 2004, I was a visiting faculty member at Intel Research Cambridge working in the group of Christophe Diot. My main research interests are in Internet measurements and traffic analysis, user quality of experience and network transparency, new network architectures (ICN and SDN), and performance evaluation of computer networks. I am senior member of the IEEE and the ACM. ACQUA: Monitoring Internet access and Quality of User Experience. Supported by Inria ADT ACQUA, Inria IPL BetterNet and ANR BottleNet. Offloading mobile networks by content caching at the edge (or in vehicules). HBSD (point-to-point) and CEDO (interest-driven) are distributed and collaborative solutions for managing the resources of mobile nodes. MobiTrade is another solution for non-collaborative scenarios. Adaptive traffic sampling. Supported by the FP7 ECODE project. Have a look at our platform MonLab for traffic emulation and NetFlow measurements. Internet traffic classification and host profiling. Supported by the ANR CMON project. BitHoc: Content sharing in mobile wireless networks. Supported by the ITEA Expeshare project. Understanding the properties of the BitTorrent Overlay. Supported by the ANR OSCAR project. Scalable solutions for data collection. Supported by Hitachi Europe. Visit TICP web page for more details. Senior member of the IEEE (2010) and the ACM (2018). Best student paper award for our paper “On the Cost of Measuring Traffic in a Virtualized Environment“, IEEE Cloudnet conference, Tokyo, October 2018 (Certificate). Best paper award for our paper “Optimal Buffer Management Policies for Delay Tolerant Networks”, IEEE SECON conference, San Francisco, June 2008 (Certificate). 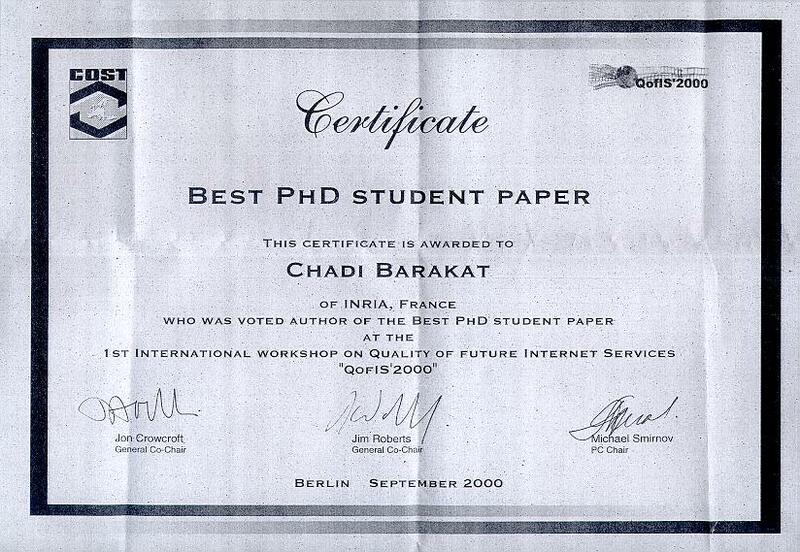 Best PhD student paper award for my paper “On ACK filtering on a slow reverse channel”, first international workshop on Quality of future Internet Services, Berlin, September 2000 (Certificate). Hariri foundation award, top 100 funded by the foundation in Lebanon and abroad, five times from 1993 to 1997. Associate editor for the Elsevier Computer Networks journal (2012-present). Workshop Co-Chair for ACM CoNEXT 2018, Greece. Member of the Conseil d’Orientation Scientifique et Technologique, working group on international affairs (COST-GTRI), at INRIA (2011-present). Scientific correspondent and referee for international affairs at INRIA Sophia-Antipolis (2011-present). General Co-Chair for ACM CoNEXT 2012, Nice. Guest Editor for an IEEE JSAC special issue on Sampling the Internet: Techniques and Applications (2006). Area Editor for ACM Computer Communication Review (2005 – 2010). General Chair for WiOpt 2005 workshops (Riva Del Garda, Italy). General Chair for PAM 2004 (Juan Les Pins, France). Session chair at ACM IMC 2017 (London), ICCIT 2013 (Beirut), ACM IMC 2011 (Berlin), ACM IMC 2005 (Berkeley), WiOpt 2003 (Sophia Antipolis), ICNP 2002 (Paris). Member of the recruitment committee at the computer science department of the University of Nice Sophia Antipolis (2005-2008), member of the directorial board for the Master RSD of the University of Nice Sophia Antipolis (2005-2008), and responsible of the internship program at the latter Master (2005-2008). Evolving Internet, 12 hours, Master IFI/Ubinet, University of Nice Sophia Antipolis, 2008-present. Internet Measurement and New Architectures, 9 hours, Master IFI/Ubinet, University of Nice Sophia Antipolis, 2008-present. Computer Networks, 12 hours, Master 1 in Computer Science, University of Nice Sophia Antipolis, 2018-present. Voice over IP, 6 hours, Master ESTEL (ex-TSM), University of Nice Sophia Antipolis, 2007-present. Internet and Networks, 18 hours, Master 1 International in Computer Science, University of Nice Sophia Antipolis, 2013-present. Internet Measurement and Traffic Analysis, (i) Networking and Distributed Systems Master at the University of Nice Sophia Antipolis, 15 hours, 2004-2007, (ii) Master RIM, ENSI, Tunis, 15 hours, 2003-2007, (iii) AIT Thailand, 15 hours, 2003 and 2005, (iv) Master Telecom ParisTech, 3 hours, 2009-2013, and (v) ETH, Zurich, 2 hours, 2009. Wireless Networking, 7 hours, Master RISM (ex-RTM), IUP Avignon, 2009-2015. Overview of Information Centric Networking, Master Telecom ParisTech, 3 hours, 2014. Local area networks, 21 hours + 10 hours practical work, IUT of the University of Nice Sophia Antipolis, 2007-2013. Ns-2, the Network Simulator, 7 hours, at the Networking and Distributed Systems DEA of the University of Nice Sophia Antipolis and at the Master RTM at IUP Avignon. The course is followed by practical exercises on the simulation of real scenarios (slides and exercises in English, slides in French). Internet over Satellites, 6 hours, Networking and Distributed Systems DEA, University of Nice Sophia Antipolis, France, 2000 (slides). Content dissemination in mobile wireless networks, UCN@SOPHIA Info Day, Sophia Antipolis, February 2013 (slides). On message drop and scheduling in Delay Tolerant Networks: Theory and practice, Ecole francophone CFIP, 2011 (slides). Monitoring of Internet traffic and applications, ETH Zurich, 2009 (slides). Issues related to the modeling of the TCP protocol, E-next school, Louvain, November 2005 (slides). Scalable solutions for information collection, KTH, Stockholm, September 2005 (slides). On TCP performance in heterogeneous networks, Summer Research Institute, Lausanne, July 2002 (slides). 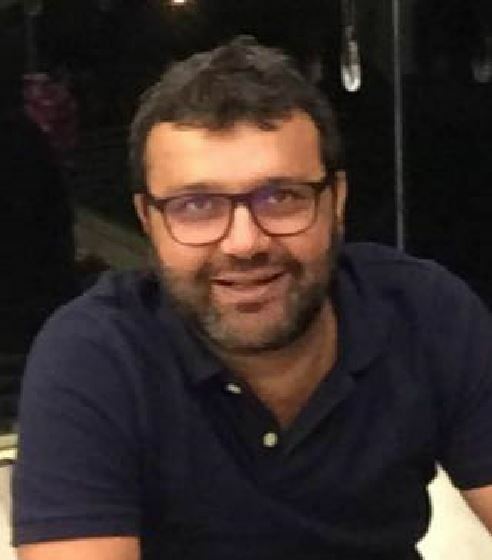 Othmane Belmoukadam. Started in October 2018. Funded by the University of Nice Sophia Antipolis and the University Côte d’Azur. Thesis title: QoE aware content management in the Internet: caching and transport. Thibaut Ehlinger. Co-supervised with Vassilis Christophides. Started in November 2017. Funded by Inria Project Lab BetterNet. Thesis title: Mapping Quality of Service metrics to user Quality of Experience in the Internet. Imane Taibi. Co-supervised with Gerardo Rubino and Yassine Hadjadj-Aoul. Started in November 2017. Funded by Inria Project Lab BetterNet. Thesis title: Big data analysis for network monitoring and troubleshooting. Karyna Gogunska. Co-supervised with Guillaume Urvoy-Keller. Started in October 2016. Funded by the UCN@SOPHIA Labex. Thesis title: Empowering Virtualized Networks with Measurement As a Service (MaaS). Jawad Khokhar. Funded by ANR BottleNet. Started in January 2017. Thesis title: Modeling QoE of Internet Applications by Controlled Experimentation and Machine Learning. Luigi Vigneri. Co-supervised with Thrasyvoulos Spyropoulos. Graduated in July 2017. Funded by the UCN@SOPHIA Labex. Thesis title: Vehicles as a Mobile Cloud: Leveraging mobility for content storage and dissemination (Dissertation). Riccardo Ravaioli. Co-supervised with Guillaume Urvoy-Keller. Graduated in July 2016. Funded by the UCN@SOPHIA Labex. Thesis title: Active Inference of Network Neutrality (Dissertation). Amir Krifa. Graduated in April 2012. Thesis title: Towards better content dissemination applications for Disruption Tolerant Networks (Dissertation). Imed Lassoued. Graduated in December 2011. Funded by the ECODE FP7 project. Thesis title: Adaptive Monitoring and Management of Internet Traffic (Dissertation). Karim Sbaï. Co-supervised with Walid Dabbous. Graduated in October 2010. Funded by the ITEA Expeshare project. Thesis title: Architecture for data sharing in mobile wireless networks (Dissertation). Mohamad Jaber. Co-supervised with Philippe Nain. Graduated in October 2011. Funded by the French ministry and supported by the CMON ANR project. Thesis title: Internet traffic profiling and identification (Dissertation). Mohammad Malli. Co-supervised with Walid Dabbous. Graduated in September 2006. Thesis title: Revisiting Internet Topology: Application-Centric Approach (Dissertation). Victor Ramos. Co-supervised with Eitan Altman. Graduated in December 2004. Thesis title: Reliable and robust transmission of multimedia contents over the Internet (Dissertation).